The Davao Food Appreciation Tour (DFAT) was held last June 14-16, 2013. This year's edition was exclusive for Davao bloggers. They welcomed a few Manila-based bloggers and it was a pleasure to have been invited to join them. I am definitely not a foodie nor can I consider myself a travel enthusiast, but I do love food even if it doesn't really show with my petite frame. And so before anything else, "Thank you" to the DFAT 2013 organizers for letting a nail art blogger join them in this esteemed event. 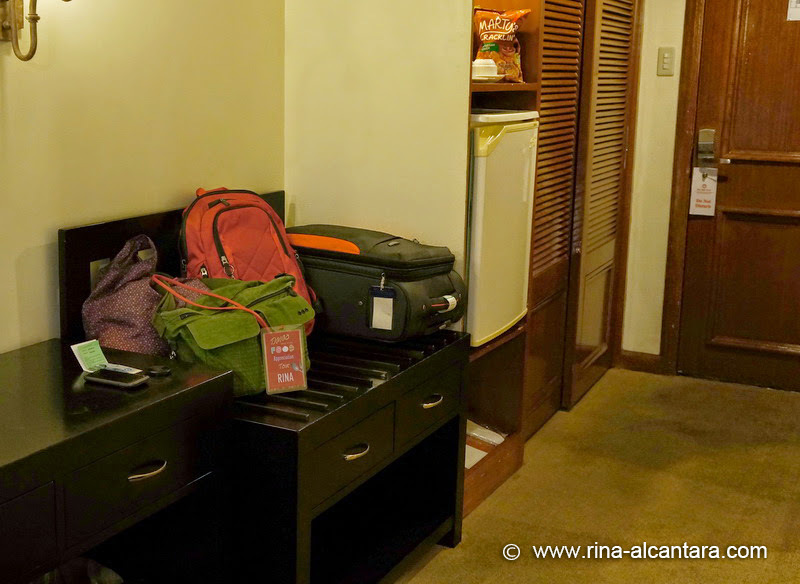 Customer service was at its best the moment we arrived in Apo View Hotel, Davao City. Check-in was a breeze and we were closely guided by the staff to our designated rooms. 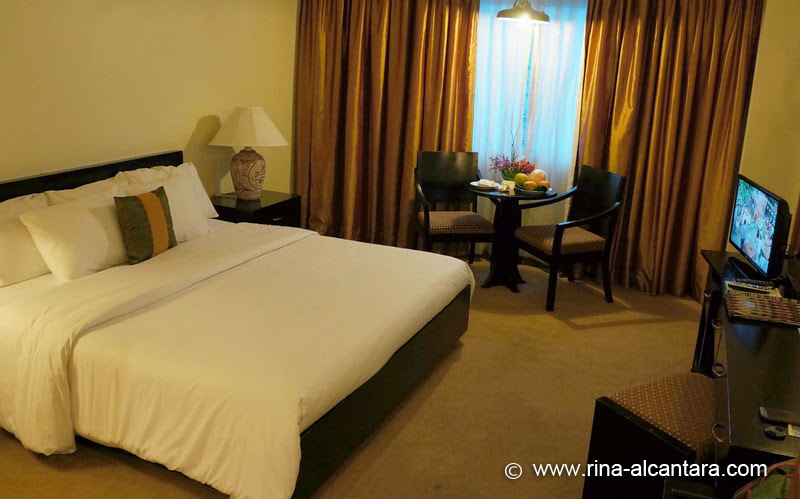 I was ushered into a deluxe room with a matrimonial bed all to my lonesome! ;) I move a lot when I sleep so the sight of a matrimonial bed that can fit 3x of me is very enticing! There was a complimentary fruit plate sitting on the small dining table near the window where you get a good view of the city. I used this space a lot when I couldn't sleep at night and just wanted to watch something on the tube. I also did my nails here because of the overhead lighting. The room includes a closet, a mini refrigerator, a long working table (good if you're traveling with a laptop), and a mini vault for your valuables. Oh, and I always like that little table/dresser(?) where I can organize all my things. I'm a bit OC that way. The bathroom had a tub, hot and cold shower, a hair dryer, and a complete set of toiletries. My sister and I have this habit of having a bubble bath before sleeping whenever there's a bath tub. Well, I didn't disappoint our tradition! This remains to be on my list when I finally get a house of my own. Me during the first night, being too comfy on my oversized bed! The room includes a buffet breakfast at the Entree Restaurant located at the hotel lobby, free use of swimming pool, free wifi (very important for bloggers like myself). There's also an in-house casino and an outdoor space that can be used for smoking or for a little relaxation with nature. 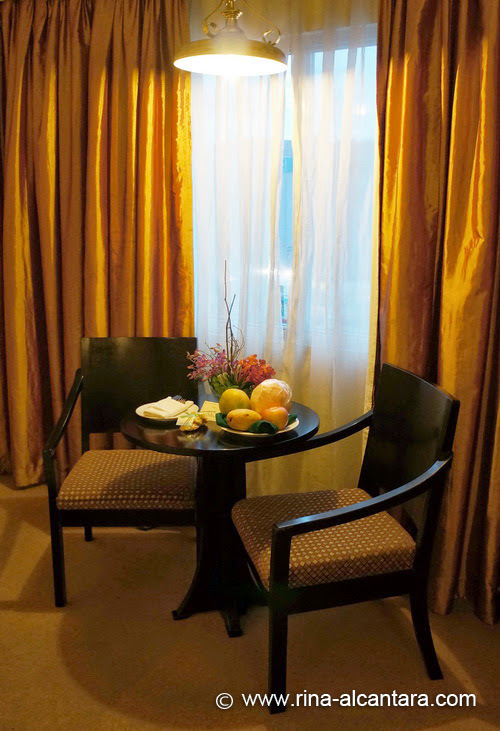 Apo View Hotel is located at the heart of Davao City in 150 J. Camus Street. For more information, please visit their website at www.apoview.com or like their Facebook Page at www.facebook.com/TheApoViewHotel. Again, thank you very much to the DFAT 2013 organizers and to Apo View Hotel for the warm welcome and generosity they have extended to me during my stay. I will certainly come back.